Don't mess with the hassle of bringing a boat - rent from us! Our Bass boats are late model Procraft, with Mercury outboards ranging from 60hp, trolling motors, and electronic fish-finders. All bass boats have live wells. All craft meet U.S. Coast Guard safety standards. Please, no water skiing with the bass boats. *Bass Boats include trolling motor, live well, & locator. Deck Boats include skis, vests, and tow rope. $50 deposit required on all boat rentals. Prices do not include fuel and 10.5% tax. Deck boats look like pontoon boats but are not. They run at higher speeds and maneuver similar to a ski boat. 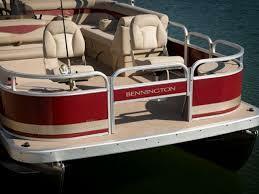 However they offer all the features of a pontoon. 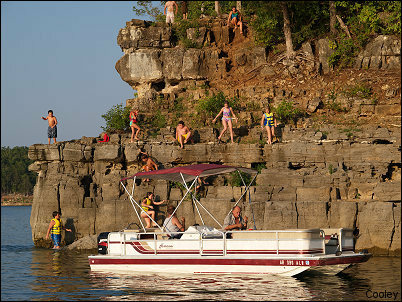 You can move about freely just as you can aboard a pontoon. We recommend the deck boat for guests who want to do a little of everything - water ski, fish, and swim off the boat in a cove. Our deck boat comfortably seats 9 people. It meets all U.S. Coast Guard safety standards. Deck boat rental includes water skis, ski vest, and tow rope. At the Rocking Chair Boat Dock you can sunbathe, swim, and of course, moor your boat. You can come and go 24 hours a day, which is important to night fishermen. Ours is the only dock in this well-protected cove. When winds come up and swells develop, we don't get rough water. Our stalls are large enough for wide boats. The dock is well lit. There are 110vac electrical outlets for charging batteries at each stall, and a fish cleaning station with water. Right above the dock we have two parking lots providing plenty of space to park. You can also walk down to the dock from your cottage. If you book a local fishing guide, they will pick you up at our dock in the morning, and bring you back at the end of your fishing trip. There are several full service marinas and several hard-surfaced launch accesses within a short boat/auto drive from our dock.